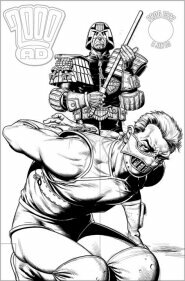 BRIAN BOLLAND RETURNS TO 2000 AD! Brian was one of the first artists to draw Orlok in the final episodes of Block Mania, and was with this in mind that he was specifically commissioned to kick off the Sov agent's trial. These images show his original rough sketch and the inked version. You can see his final coloured cover on the front of Prog 1336, on sale 16 April 2003, which features - alongside Dredd - the first episodes of A.B.C. 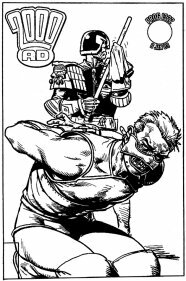 Warriors by Pat Mills and Carlos Ezquerra and Snow/Tiger by Andy Diggle and Andy Clarke.